1756- 1842. He was born on 17 November 1756, the son of John Woodriff of Deptford, a shipwright and carpenter’s mate, and of his wife Mary. 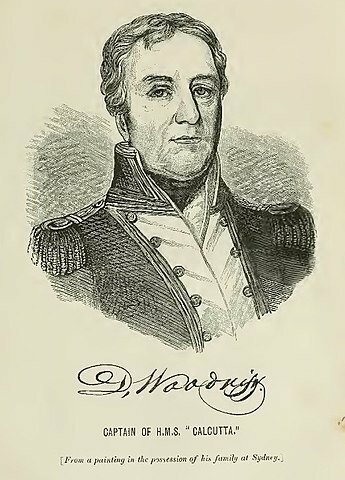 In 1778 Woodriff was pressed into the navy, and he soon rose from the lower deck to be commissioned lieutenant on 1 April 1783. During the early years of the peace he was employed in command of the galley Dependence in the relocation of American loyalists from the Carolinas and Georgia, on which duty he met his first wife. In 1789 he was appointed to the Endymion 44 en-flute for the Transport Service, but she was wrecked under his command in uncharted waters off Turks Islands in the Caribbean on 20 August 1790 with the loss of one life. At his subsequent court-martial in Kingston, Jamaica, he was acquitted of any blame for her loss, and he returned to England with his family aboard a merchant vessel. In 1792 Woodriff took the transport Kitty out to Port Jackson in New South Wales with supplies for the relief of that fledgling settlement. After returning to England in 1794 he was promoted commander on 18 September 1795, and in the same year was appointed the principle agent for transports at Southampton and Portsmouth, a post he held until 1797. Next taking up the position of principle agent for transports at Kings Lynn, amongst his responsibilities was the superintendence of the French prisoners-of-war at Norman Cross in modern day Cambridgeshire. In this capacity he was obliged to issue a report on the ‘pernicious’ behaviour of certain inmates who profited to the detriment of their fellow countrymen. He was later the principle agent for transports in the unsuccessful Netherlands campaign of August – October 1799, at the culmination of which he was praised by Lieutenant-General Sir James Pulteney for his role in evacuating the troops. Woodriff was posted captain on 28 April 1802, and in November he was appointed to the Calcutta 50 en-flute, which at the time was fitting out at Portsmouth for the conveyance of convicts to Botany Bay. In April 1803 the Calcutta set sail for Fort Philip in the Bass Strait with four hundred and fifty convicts who were intended to form a settlement under the colonial administrator, David Collins. After visiting Rio de Janeiro in the middle of July and passing the Cape a month later the Calcutta reached her destination in early October. Here Collins found the conditions non-conducive to the founding of a settlement and he instead relocated to Hobart on Tasmania. Meanwhile Woodriff adhered to his original orders which were to expeditiously return to England with naval stores from Port Jackson. After helping suppress a mutiny of convicts at Port Jackson he departed for home in March 1804 via Cape Horn and Rio, which he reached in the middle of May, eventually arriving in England on 23 July. He was rewarded for his role in the suppression of the convict revolt with a thousand acre land grant at Penrith in Cumbria. The Calcutta was next commissioned as a 50-gun ship and was sent out to bring home a merchant convoy from St. Helena. On 26 September 1805 near the Scilly Islands Woodriff’s command had the misfortune to fall in with a French squadron of five sail of the line and three frigates under the command of Captain Zacharie Jacques Théodore Allemand, who had set out on a cruise on 16 July. In attempting to protect the convoy he quickly saw off the frigate Armide 40 but was compelled to strike by the Magnanime 74, having lost six men killed and six wounded. His sacrifice was not in vain, for all but one of the convoy escaped. After remaining aboard one of Allemand’s ships for the best part of four months, during which time the French squadron visited Tenerife, Woodriff was eventually landed at La Rochelle, from where he was escorted into the interior with some of his officers and an East Indian colonel by the name of Callender, together with the latter’s wife. Passing through Tours in February 1806, the party reached Verdun after a five week journey, and here he remained on parole in reasonable comfort. Having made several unsuccessful representations to the French foreign minister, Charles-Maurice de Talleyrand-Périgord, Woodriff was unexpectedly exchanged at the beginning of June 1807 on the express orders of Napoleon, who at the time was campaigning in Poland. The French officer released from parole in reciprocation by the British government was Captain Jean-Jacques Magendie, who had commanded the Bucentaure at the Battle of Trafalgar. By this point of the war the French authorities had brought an end to the system of exchange, so Woodriff’s release was a significant honour indeed. Returning to Portsmouth on a cartel, he faced a Court of Enquiry aboard the Gladiator at Portsmouth on 1 February 1808 which acquitted him of any blame for the loss of the Calcutta. Woodriff was appointed agent for prisoners of war at Forton, Gosport at the end of 1808 and in 1809 served as the principle agent for transports for the Walcheren Expedition, which left England in July, although his most significant task was to superintend the re-embarkation of the troops in November. He later became the resident commissioner at Jamaica in 1814 where he remained until 1822 before retiring to Gosport. He was admitted to Greenwich Hospital on 9 November 1830 and was nominated a CB on 26 September 1831. In 1834 he barely escaped with his life when he was knocked down by a horse and cart in Nelson Street. He became a captain of Greenwich Hospital in 1837 in preference to accepting flag rank, and he died there on 25 February 1842. Following the end of the American War of Revolution Woodriff married the orphaned loyalist Asia Sumarel, with whom he had three sons and three daughters. His sons, Daniel James Woodriff and John Robert Woodriff, entered the Navy to reach the rank of lieutenant during the Napoleonic War, whilst his youngest son, Robert Matthews Woodriff, died as a lieutenant in 1822. All three served with him aboard the Calcutta. Following the death of his first wife Woodriff was married on 30 December 1827 at Gosport to his cousin, Sarah Woodriff. She died in 1860.